Love it or hate it, the Disney Dining Plan can make or break your vacation, financially. The Disney Dining Plan is an option available exclusively to Disney World Resort guests who book a Magic Your Way Package (room, tickets, and dining) as well as members of the military (room and dining only). People who need to purchase a dining plan, if you’re booking one these packages are adults ages 10+ and children ages 3-9. If your child is under 3 you do not need to purchase a meal plan. The way it works is that you first pre-purchase the dining plan. Then depending on which plan you get, you’ll have a certain number of quick service, table-service, and snack credits that you can use throughout your trip. The best thing about it is that Disney has a plan for every budget and dining taste. Whether if you’re a heavy eater, or if you prefer to eat lightly throughout the day, Disney has a dining plan that can cater to your needs. Once you arrive at Walt Disney World, you will be able to use your dining plan credits at over 100 select restaurants across Disney property, including some non-Disney owned restaurants. (Click here to see our Disney Dining Plan Restaurant Listing). To jump straight to how you can maximize your Disney Dining Plan Credits, just click here. You can use your dining plan credits on snacks, quick service meals, and table-service meals. For snacks, you’ll know if you can use your dining plan snack credits only if they have this logo. And as a good rule of thumb, if it’s under $5 generally, it’s a snack. And don’t worry, tax is always included so you won’t have to worry about that. Depending on your dining plan, you’ll get a certain amount of credits for these options based on the amount of nights you stay at your Disney resort. But don’t worry, you don’t worry, you can use your meal credits whenever you want. So just eat when you want to eat. So with that being said, let’s jump straight into all the dining plans that you can choose from. These are the types of meals you’ll be able to enjoy with you dining plan credits, based on the restaurant type, time of day, and meal type. Here are all the Disney Dining Plan options that you can purchase for yourself and your group. We also included the price of each plan and how much you’ll prepay per night. With the basic dining plan, the cost per night is around $60-$61 per adult and $19 per child. This is dining plan is a little bit pricier than the basic one but that’s mainly because you get more meal options and flexibility. Here’s what you get with this dining plan. With the Deluxe Dining Plan, the cost per night is around $110 per adult and $30 per child. But these prices may increase during peak travel season. With the Quick Service Dining Plan, the cost per night is $42 per adult and $16 per child. Besides the fact that you get 3 credits which can be used for Signature Dining, Character Meals, and Dinner Shows, the main attraction for these plans are the additional Disney World amenities that you have access to including spa treatment, golf, recreation, special events, tours, and more. You can learn more about these additional benefits here (Premium, Platinum). The average cost per night for the Premium Plan is $195. What’s Not Included in the Dining Plan? Did you know that if done properly, you can actually eat more food than what you already paid for? Crazy, right?! You just gotta know where to eat and when to go. Luckily, I got you covered! So let’s give you a quick refresher on how much each credit is worth again. So, in order to truly maximize you need to eat snacks and meals that are more expensive than those credit values. Go for the most expensive meal on the menu, especially if you’re aren’t a picky eater. This usually includes steak, lobster, milkshakes, juices, ribs. Character meals are one of the best uses of a meal credit, especially for dinner. Character breakfasts are a pretty good use of credit, but in all honesty, you can get a lot more higher quality (and more expensive) foods for dinner. 1900 Park Fare for dinner is always a good bet, as well as Chef Mickeys. Don’t ever use you quick service or table service credit on breakfast. Breakfast is always the cheapest meal and when using the meal plan you get less food. For example, a quick service breakfast gives you an entree and a non-alcoholic drink, while a quick service lunch/dinner gives you an entree, dessert, and non-alcoholic drink. Don’t ever use your credits on signature restaurants. Since these restaurants require 2 table service credits ($74) you’ll generally never eat enough food to make up the costs. You’re better off just paying out of pocket at these restaurants. For other incredibly helpful Disney Dining Plan Tips, Tricks, and Secrets, be sure to check out my killer guide. Below, you’ll find some pretty detailed infographics/charts as well as in-depth info for each respective meal credit category. Just click on the links and you’ll be on your way to huge savings! Here’s my listing about the best ways to truly maximize your Disney Dining Plan snack credits (worth $5), including the best bangs for your buck. But always remember, just because it’s expensive doesn’t mean it’s always tasty. These ice cream sandwiches differ from the ones you’ll find at all the ice cream carts throughout the parks in the fact that they are made right in front of you. Basically, they’ll take two soft fresh baked cookies and fill it with the ice cream of your choice. You can find this at the Sleepy Hollows and Electric Umbrella at Magic Kingdom, just to name a few. Or you can even get a macaroon ice cream sandwich from L’Artisan de Glaces in the France Pavilion at Epcot. If you’re ever at Magic Kingdom, then you should definitely get one of the chocolate chip ice cream cookie sandwiches from the Plaza Ice Cream Parlor. They’re so delicious! This is quite possibly the most sought after treat at Walt Disney World. Pineapple vanilla swirl ice cream with pineapple juice. It’s pure perfection. You can also get these with citrus flavored ice cream as well as candy corn ice cream (seasonal). You can find Dole Whip Floats at Aloha Isle and Sunshine Tree Terrace at Magic Kingdom and Pineapple Lanai at the Polynesian Resort. Quite possibly the best bakery in all of Disney World. 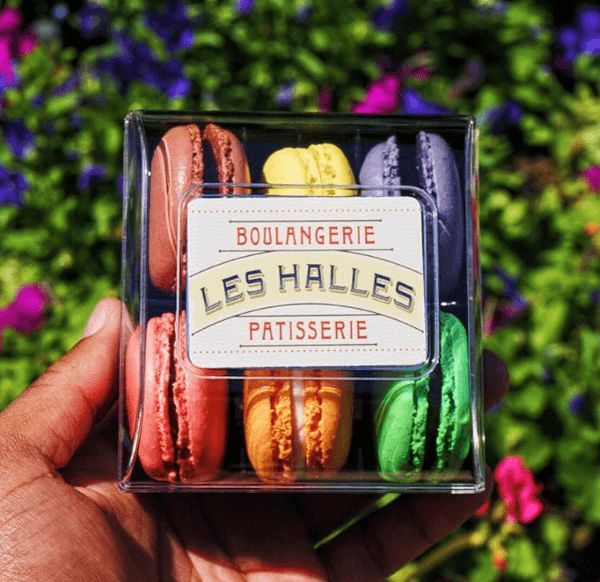 The “French Bakery” (aka Les Halles Boulangerie at Epcot) offers some of the tastiest and most unique treats that you won’t find anywhere else at WDW. You honestly can’t go wrong with any of the desserts. But my personal recommendations include the Napoleon and the Tarte aux Fraises. 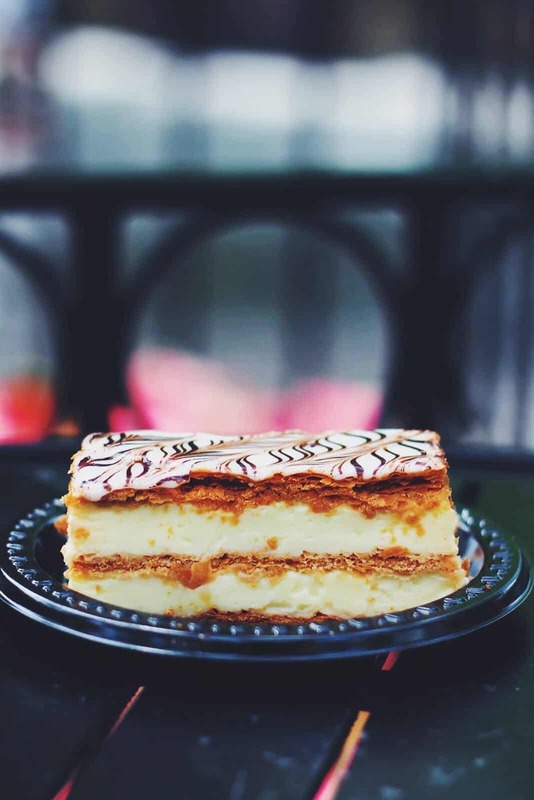 You can also check out my list of incredibly delicious Epcot desserts, or these desserts which are better than Norway’s school bread. If you love caramel then this German bakery (Epcot) has your name written all over it. From salted caramel brownies and caramel popcorn, to caramel apples and caramel pecan bars, this is a great place to spend your DDP snack credits. Specialty cupcakes, mainly from Starring Rolls Cafe at Hollywood Studios, offer you some of the tastiest cupcakes across all the “world.” Guests’ favorites include the Butterfinger Cupcake and the Double Chocolate Peanut Butter Cupcake, both of which are incredible. The hardest part is just convincing you to not get both! You can also find other delicious specialty cupcakes at most Disney bakeries, and some quick service locations. But Starring Rolls Cafe definitely has the most unique of them all. This looks like the Butterbeer from the Wizarding World of Harry Potter (Universal Studios) but the taste is 100% different. It’s a frozen apple drink with marshmallow syrup and a mango passion fruit foam. It’s not too shabby. Walk down Main Street U.S.A. at Magic Kingdom and you’ll be sure to smell some freshly pressed waffle cones coming out o the Main Street Ice Cream Parlor. These sundaes are some of the best that all the parks can offer. Plus it’s a great way to cool off during those hot summer months. 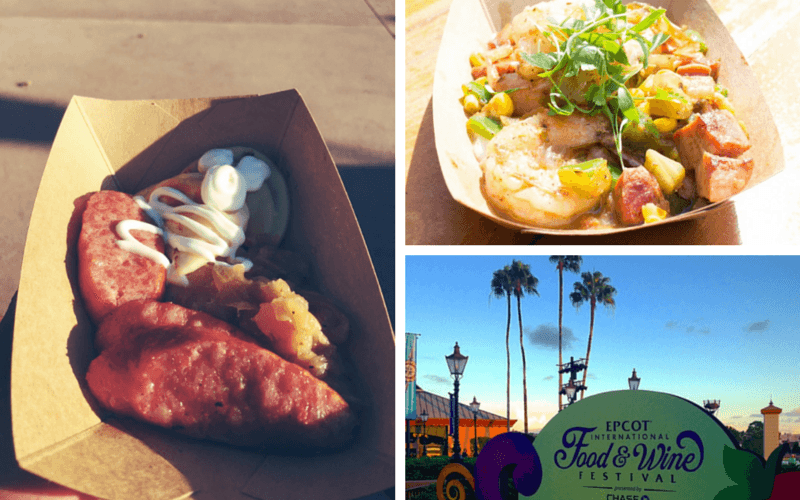 Last but not least, one of the best ways to maximize your Disney Dining Plan snack credits is to use them during the Food and Wine Festival. Most of the foods at the country carts/kiosks range anywhere from $3-9 and they’re all considered snacks. So if you really want to say some money, you should use your snack credits during this time. If still want to get the full rundown of all the best Disney World snacks, check out this in-depth guide to maximizing DDP snack credits. Here’s an awesome chart by WDW Prep School listing all the best Quick Service Restaurant values. Be sure to show Shannon for WDW Prep School some love by checking out her awesome in-depth Disney World trip planning blog. Here’s another awesome chart by WDW Prep School listing all the best Table Service Restaurant values. Be sure to show Shannon for WDW Prep School some love by checking out her awesome in-depth Disney World trip planning blog. Also, according to WDW Prep School, be sure to add the price of an appetizer to the chart if you’re on the Deluxe Disney Dining Plan. This options is entirely up to you. Sure there are ways to maximize every single dollar on the plan, but there are always ways to totally lose out. I’ve been to Disney World using the meal plan, and currently living in Orlando, I’ve been to Disney without the plan. And honestly, if done correctly, the meal plan is a great way to really save money, while focusing more on what you want to eat, as opposed to focusing on what you can or cannot afford. But that’s just me. Here are some of the pros and cons of purchasing the Disney Dining Plan for your next vacation. The dining plan is perfect for people who are really looking to follow a strict budget. Since the dining plan is prepaid before you get to Disney World, you essentially won’t have to worry about any additional food costs. 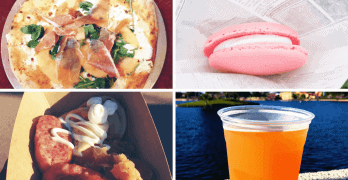 Sure you might want an extra snack here or there or a glass of beer in Epcot, but generally, your food budget is all set. In terms of budgeting, I believe the greatest value the Disney Dining Plan brings to you is the predictability. With the plan, you already know what you’re eating and how much it costs per night. This essentially prevents an occurrences when you overpay for something or exceed your daily budget. Also, since Disney food is pretty darn expensive, there may be times when you can’t order that filet mignon or lobster tail because the menu price is too expensive. However, with the dining plan you basically don’t even have to worry about prices, but instead focus more on what sounds delicious on the menu. I generally believe that the dining plan is there to help you worry less about food costs and more about what you want to eat. It’s a mind game. In honesty it’s not as convenient as you’d hope mainly because there are limitations on what you can and can’t eat. I mean seriously, if you’re enjoying a meal at a Table Service Restaurant, you can’t order appetizers through your plan. It doesn’t cover certain meal additions. And it doesn’t cover alcohol. Sure you can always pay out of pocket, but doesn’t that defeat the purpose? Also the dining plan kind of forces you to eat. Since you have a certain amount of meal and snack credits per day, you have to make sure that you use all of them before your trip is over. This sometimes might be a hassle if you cut your trip short or if you’ve skipped a couple meals here and there during your trip. I mean seriously, the last thing you’d ever want is to have to use 2 table service, 2 quick service, and 4 snacks all on your last day. Convenience can be an issue. If you love to eat or have expensive taste, the dining plan is perfect for you. Since there’s no maximum amount you can spend per meal, you can essentially eat at a delicious buffet dinner (like ‘Ohana) which normally costs $44 per person, all for only $35. This definitely adds up in savings and essentially allows you to eat more food than what you paid for. But if you’re generally a person who doesn’t eat heavily or prefers to skip meals, the dining plan isn’t really for you. So basically, if you eat on average 2-3 solid meals a day, the dining plan is a must. When your food is prepaid, it makes your trip feel a lot more fun. Since you aren’t constantly checking food prices, you tend to focus more about the food and less about the tab. It truly gives you that vacation feeling. Getting the meal plan is entirely up to you. There’s pros, there’s cons but at the end of the day you have to ask yourself the question whether or not it’s worth the investment. If you’re a big eater and truly want to maximize every single dollar by eating the best foods at the best restaurants, then this plan is for you. However, if food is just an afterthought during your vacation or if you’re not the heaviest of eaters, you may not get your moneys worth. Whether or not if you get the dining plan, you’re still going to have a magical time at Walt Disney World riding incredible rides, watching breathtaking shows, relaxing at beautiful resorts, meeting fun characters, and most importantly, eating incredibly delicious foods with the best people. Here are some of the most common questions people have about the dining plan. Can I order anything off the menu with the dining plan? Typically yes. However, this doesn’t include alcohol, meals designed for 2, and add-ons (lobster tails, etc). You get credits based on the amount of nights you stay. However, just remember, you will not have any credits for your resort-check out day. Can I buy the plan after I get to Walt Disney World? No. You have to purchase the dining plan and have it added to your reservation at least 48 hours prior to check in. Can I buy the dining plan and resort room only, without park tickets? Yes and No. In order to purchase the Disney Dining Plan you need to book a Magic Your Way Package which includes parks ticket, hotel room, and dining. However if you are an annual passholder, Disney Vacation Club Member, or member of the U.S. military (active duty, reserve, or retired) you can get just the hotel and dining plan only. Can I get the Dining Plan if I purchase my tickets from an authorized vendor or reseller? No. You must purchase a Magic Your Way package (tickets, hotel, dining plan) all together. How can I tell how many credits I already used? There will be a number of credits available printed on your receipt for every meal and snack purchase. The receipt will show how many credits you’ve used and how many you have left. If you just want to know what number you’re currently at, you can stop by your resorts concierge desk at any time and they’ll let you know. Can I downgrade my dining plan? Yes but only as long as you make the change on your reservation at least 48 hours in advance. In order to accomplish this I recommend that you give Disney a call and speak with a representative directly. Changing your dining plan works best for packages booked directly by Disney (phone or website). You can use your credits up until 11:59 pm on the day you check-out. I can’t check in until 3 pm. Does this mean I can’t use my meal plan until after check-in? No, you can start using your meal credits as soon as you register at your hotel. Your room may not be ready, but your credits are! I’m staying at Disney World for 7 days but checking out and moving to another non-Disney hotel in 5 days. Can I still keep the dining plan for 7 days? No, the dining plan is only for the exact number of nights you’re staying at a Disney resort. If I’m staying at 2 different Disney resorts, will my credits transfer over? No. You will have to book 2 separate vacations with 2 separate dining plans. It’s a hassle, I know. Do I need a meal plan to eat at certain restaurants? Nope! All restaurants are open to all Disney guests! Can some members in my significant other get a Deluxe Plan while I get a Quick Service Plan? No. All guests staying in the same room must get the same dining plan. Can I use my dining credit for room service or pizza delivery? Yes you can. This will require 2 table service credits, however. Where can I eat on the dining plan? Check out our complete listing of all quick service, table service, and signature restaurants that accept the dining plan. A refillable mug is a cup that you get after check-in that allows you to get free soda, coffee, juice, and tea refills across your resort. However, these mugs can only be used at resorts and not the parks. Can I combine 2 quick service meals to make a table service meal credit? Do I have to use 1 table service, 1 quick service, and 1 snack credit every day? No you can use as many credits you want per day. There’s no limit. You can literally go 5 days without using a single credit and spend all your credits on the 6th. Can I buy my friend a meal if I have an extra dining credit? No. Only you can use your dining plan credits. I never eat dessert. Can I opt for an appetizer instead? No, technically you can’t but it doesn’t hurt to ask. Sometimes, they may be more lenient. If I have food allergies, should I get the dining plan? This is a tough question. Although all restaurants are able to accommodate all major dietary needs like vegetarian, vegan, kosher, dairy free, nut free, soy free, gluten free, etc, there’s not telling whether or not you’re truly getting your moneys worth. This is entirely up to you. Do I have to tip my server? Yes. At most table service restaurants, you will have to tip. Only a select restaurants already include gratuities like Royal Table and dinner shows. If other people in my group aren’t on the dining plan, can we dine together? Absolutely! Just make a reservation for your entire group and you’re all set. Just when it’s time to pay, let your server know that some of you are using the dining plan, while others are not. Do I need a park ticket to eat at a restaurant inside a park? Yes. Dining Plan or not, you will need a park ticket in order to eat at a restaurant inside any of the theme parks.